If you want to class up your act with one swift sartorial blow, enter our Le Noeud Papillon & Lost In a Supermarket Silk Bow Tie GIVEAWAY today and win a beautiful Italian silk tie (or 2 silk pocket squares as runner-ups). 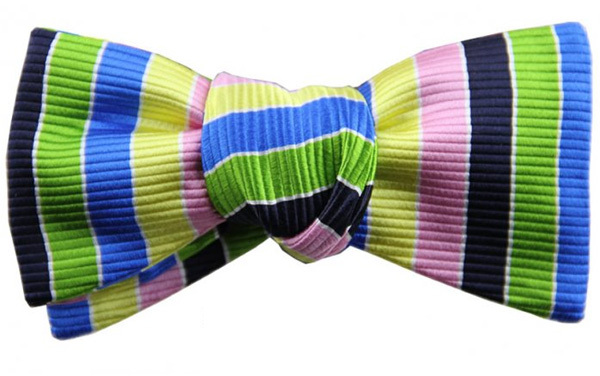 All you gotta do is write on our Facebook GIVEAWAY post telling us why you’d like to have a Le Noeud Papillon bow tie and include a link of a photo of your favorite bow tie moment in fashion history — so far we’ve got a young Einstein, David Lee Roth, Terence Stamp, Oscar Wilde, PeeWee Herman… some great suggestions already. Extra credit if you write us on Twitter saying “Hey @LostInSuprmrkt I want a @lenoeudpapillon bow tie #LIASgiveaway” and include the link to your photo (tie goes to the Twitterer). The giveaway entries closes TODAY at 10pm Wednesday PST. We’ll look over all of the entries and announce the winner this Friday, May 6th — Good Luck!